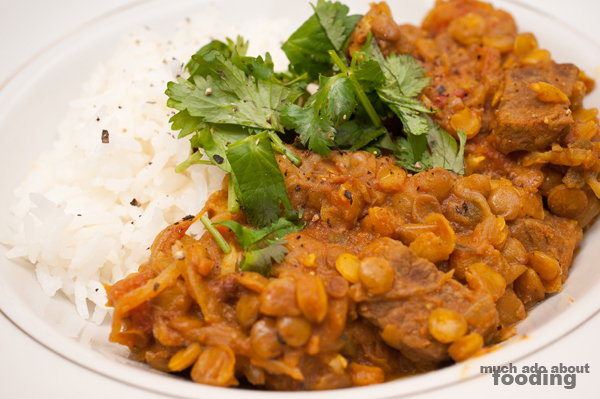 It's the second week of the Test Kitchen runs, and the ingredient this time around was lentil. Of course, a lot of "lentil soup" suggestions came out but I wanted to do something a little different and less (shall we say?) boring. Sorry, I mean, less routine. 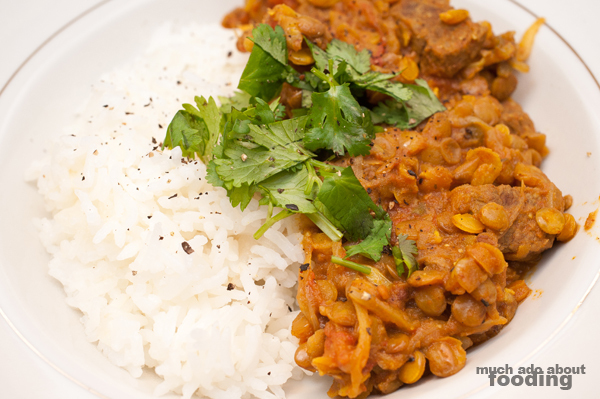 So here's a recipe for beef lentil curry adapted from here and with plenty of homestyled feel-good taste. Check out next week's ingredient at the bottom of this post and let me know what direction you'd like to see Test Kitchen go (unique ingredients vs. everyday vs. etc?)! The original recipe actually called for ground coriander and whole cumin seeds but I switched it up a little bit. In a bowl, crush together the two spices well. Thinly slice your onion and dice up the jalapeno (may use more if you want more heat). When crushing the tomatoes with your hands, be mindful of juices inside the hollow space of the tomato as they can squirt out (my bad - I splattered the kitchen with some tomato guts...). If you plan on chopping your cilantro, do this first before you use the cutting board for the meat; alternatively, use a different cutting board! In a small bowl, crush together the garlic and ginger with a pinch of salt to form a paste. In a colander with small holes or a bowl, rinse the lentils. Heat the oil in a medium skillet on medium- high heat. 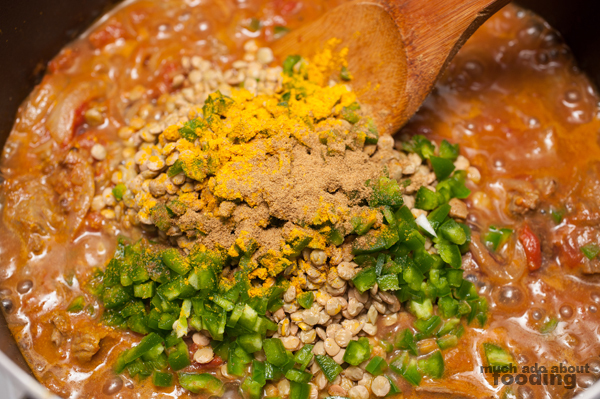 Add cumin-coriander mix and stir for approximately 1 minute before adding in onions. Saute until soft. 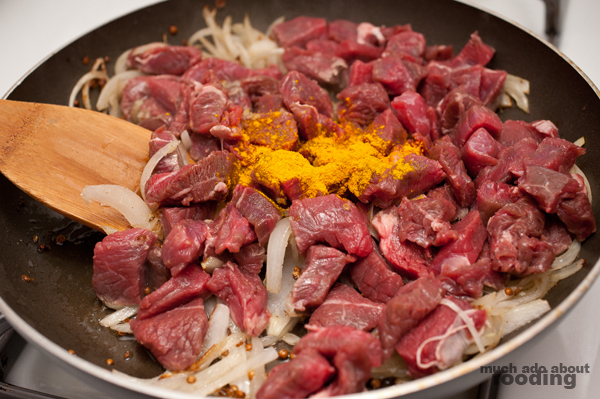 Add in garlic- ginger paste, beef, turmeric, garlic salt, and crushed tomatoes. 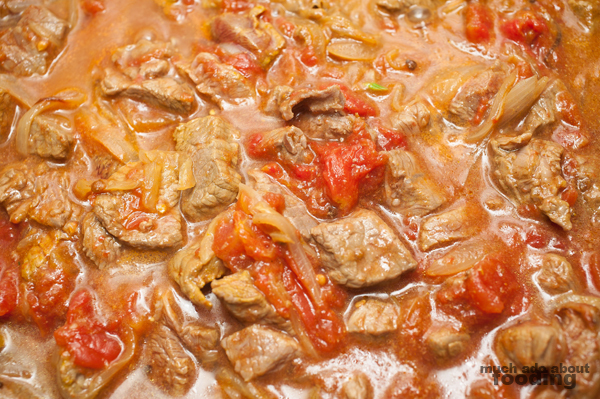 Cook 8-10 minutes until meat is thoroughly cooked and liquids have boiled down a little. 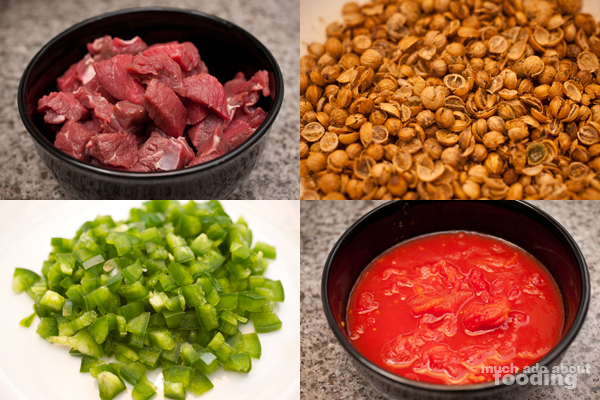 This will be the longest part of the preparation as lentils require some time to cook. Add the jalapeno pepper, chili powder, water, and lentils (I added more spices at this point than the original recipe, hence the spices in the picture). Boil concoction and then simmer (~40 minutes). If having with rice, you can start cooking that in the meantime. Once ready, serve topped with cilantro and some freshly ground pepper. Enjoy! We came across this at the grocery store, and our first thought was, "Whoa, what IS that? Let's use it for Test Kitchen!" Yeah readers, I think of you. Anyhow, we picked two of them out without any guidance on how to pick good ones and eventually started reading up on it. I'd like to see what you all come up with this week on what do make with it. 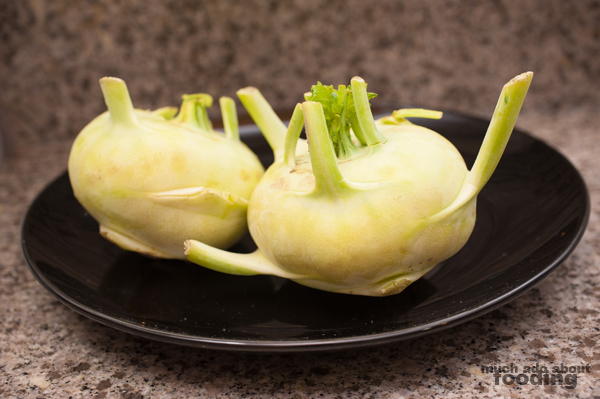 A brief background on it first though - kohlrabi is a "perennial vegetable, and is a low, stout cultivar of cabbage." [Wikipedia] Remember to submit your suggestions on Facebook/Twitter!